A little bit of pear honey. When we were older, we would pick at our music teacher’s farm during the late summer and fall. While one of us plucked at the keys, the other one would accompany mom to the piano teacher’s pasture where we would pick five gallon buckets of pears. Taking them home, we would wrap them in newspaper and place them in paper grocery sacks, waiting for them to ripen. (We picked them green and they were hard as rocks.) We would check them periodically throughout the fall, anticipating their taste of late summer. I do remember that they were a mess to put up—unwrapping, peeling, coring, canning. But, my mother relished fresh fruit. She grew up in the most arid part of the state. The only local fruit that she had as a kid was sand plums. Whenever a neighbor would call to ask if we wanted to pick cherries or pears, we were there! I had to smile last week as I was driving home from work. Someone had put out five gallon buckets on the curb with a sign “Free pears.” I was tempted to stop. I knew I would have stopped if mom had been with me. 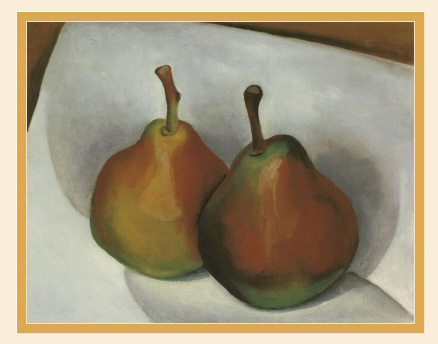 The rest of my FM pears. But, I still had a few pears from the farmers market to use up. 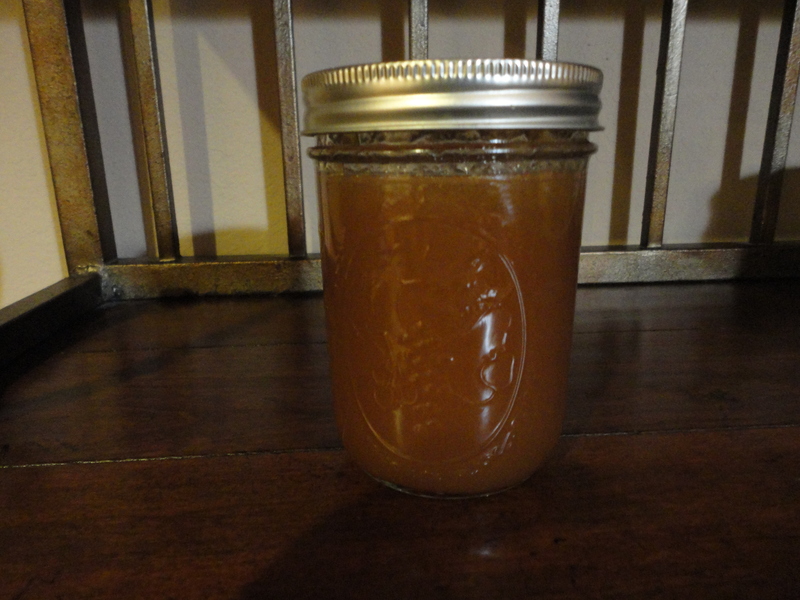 I decided to make pear honey. Mom and grandma would make a pear honey with pineapple. I wanted something a little more old fashioned. I found a recipe at Pick Your Own, a great site to find local orchards in your area. Their recipe was unbelievably simple: pear juice, lemon juice, sugar (or “Bee Honey”). I was in for an experiment. (They also listed directions for making this conserve from just the peelings of the pears.) I ran the pears through the juicer and ended up with some pear nectar. I decided to see what came out of this recipe. Since I had had such good luck with my Apple Cardamom Honey Crisp, I decided to add some cardamom pods to the pot is it simmered. 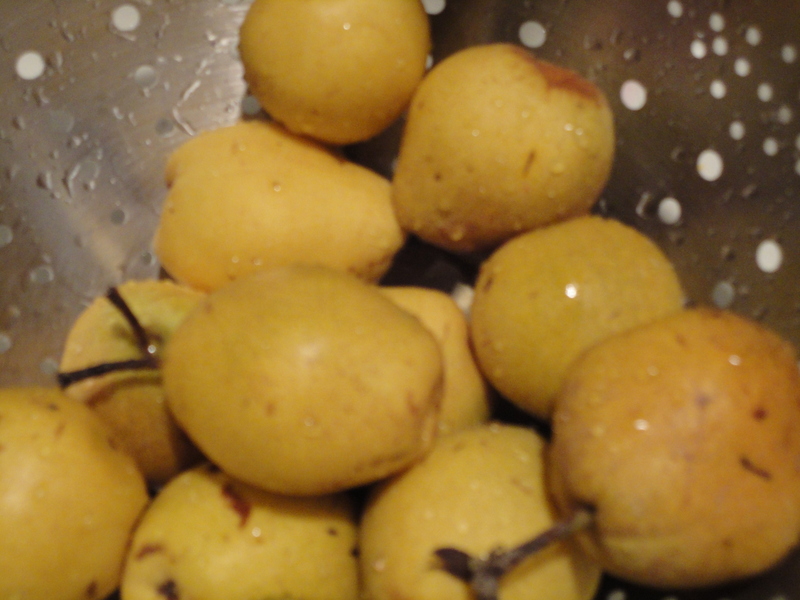 Bring pear nectar and lemon juice to a boil in a small sauce pan. Stir in honey and sugar. Place cardamom pods in a tea ball. 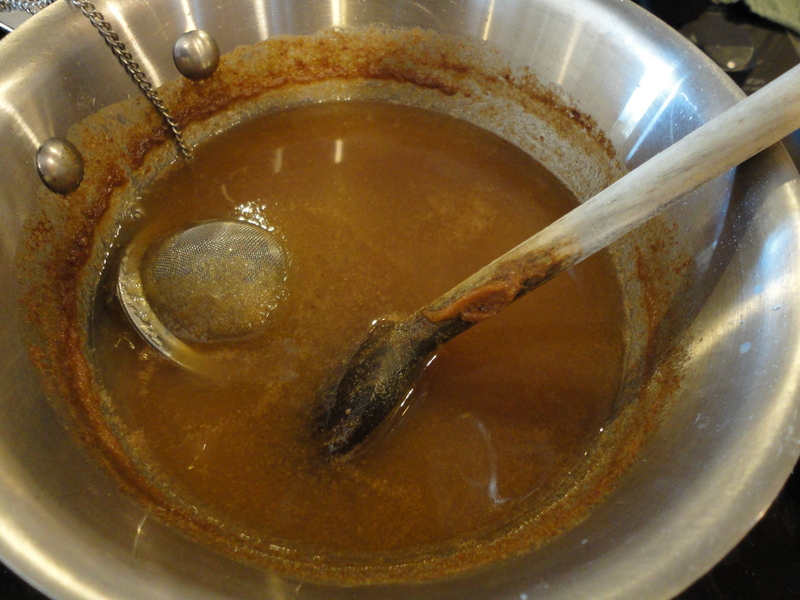 Let reduce until it is a honey consistency. I reduced it for about 30 minutes. If you are doing a big batch, the rule of thumb is half as much sugar as juice. If sealing in jars, process in a water bath. Since I just made one pint, I will just store mine in the refrigerator. I ended up with a pint of a beautiful dark amber colored pear honey. One pint of pear honey. I am going to use it on top of some spiced apple pancakes for a crisp fall breakfast. I hope you enjoy. 13 comments to A little bit of pear honey. Amazing! I bet it is so good. You could drizzle it on just about anything, waffles, french toast, pumpkin bread and so on. If I ever have a chance for a bucket of pears I’ll try it for sure. Wow – that sounds absolutely amazing! I was thinking the same thing Rhonda said – it would be great drizzled over lots of good things (and I’m thinking ice-cream!). What a delicious memories I just love drizzling over pancakes and waffles this would be fabulous! 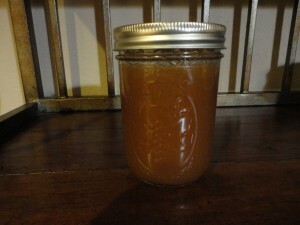 I make pear butter and give it away for christmas presents. Thanks for sharing. This makes me want to run out and buy a juicer! I love the story – food memories are special ones, particular this time of year. For my family, it was apples on fall weekend mountain drives. I should proofread before I post! I never knew that you could make a honey with pears..your idea of topping pancakes with it sounds yummy! This looks yum.. especially topping for desserts! What is pear nectar? I ran the pears (skin and all) through the juicer, so basically, unstrained juice.